The Rundown: Who was Charlie Robertson? (York) -- Charlie Robertson, the former mayor of York, died Thursday. Here's why he was a controversial figure to some and beloved by others. Robertson was a lifelong resident of York. He was a York City Police officer for 29 years beginning in 1962. He sponsored legion baseball teams and refereed youth basketball for years which made him a popular figure in the city. He lived in the same house on West Princess Street his whole life. In 1994 he was elected mayor of York. He was full of big ideas, like bringing a minor-league baseball team to York and building a roller-coaster in Memorial Park. Both of those ideas sputtered, but he did have hundreds of broken down cars towed off the streets in an effort to clean up the city. He also had George Street converted into a two-way street giving the city a north-south corridor. 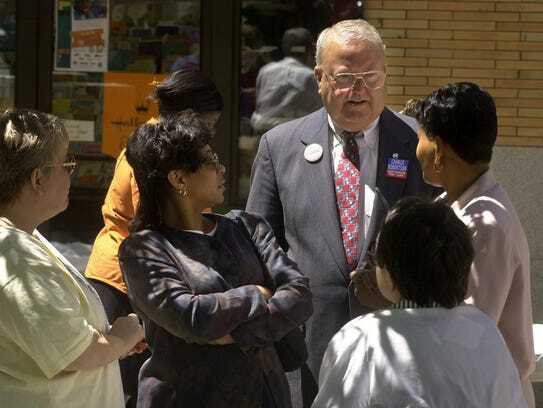 While still serving as mayor in 2001, an event from Robertson's past led to his arrest on a murder charge. That thrust York into national headlines as a sitting mayor was arrested. Robertson was a police officer during the York race riots in 1969. He allegedly supplied ammunition to and incited young white men at the height of the riots. Some of those same men later opened fire on a car of black people, killing one of them -- Lillie Belle Allen. Robertson was running for re-election at the time of his arrest and initially refused to drop out of the race, but finally did in May of 2001. He later said he wished he'd stayed in the race. Robertson was acquitted of first- and second-degree murder on Oct. 19, 2002. Several other men either were convicted or pleaded guilty in connection to Allen's death. After his acquittal, however, he largely disappeared from public life. This story is part of a partnership between WITF and the York Daily Record.